Students who were part of the Brandon University community last academic year may remember the Student Day of Action held on November 2nd, 2016. Last year’s Day of Action was to protest tuition increases, particularly for the International students on campus who pay double the tuition that domestic students do. This year, the cause students are called to rally behind is Bill 31, also called the Advanced Education Administration Act, is proposed to amend Manitoba’s current mandate that tuition not be raised more than the rate of inflation per year to allow for tuition hikes of up to 5% plus inflation per year. It would also allow for the currently regulated associated fees in courses to become unregulated — that is, for courses that may require extra materials, they will no longer be built into the course’s cost, but an additional surcharge. These increases would make the acquisition of post-secondary education impossible for some students. For a traditional, four-year degree, a student would face an increase in tuition up to 20% over the course of those four years. For other students, those who require more than the projected four years to complete a degree due to their own personal circumstances, this could mean that they simply decide not to apply to University. For this reporter, should Bill 31 pass, University would not be an option. Under the weight of my existing student loans, and the general costs of living for the average adult, the concept of eternal debt is unappealing. My personal situation is that I’ve spent more than the four years my degree should theoretically be done in, and every year adds more debt to my shoulders. The Day of Action, hosted again by the Brandon University Students’ Union will be taking place in the Kavanagh Courtyard from 11:00AM to 1:00PM on Wednesday, October 25th. Students who wish to participate have been granted academic amnesty by Senate, so if you want to take part but are afraid to skip class, worry not. 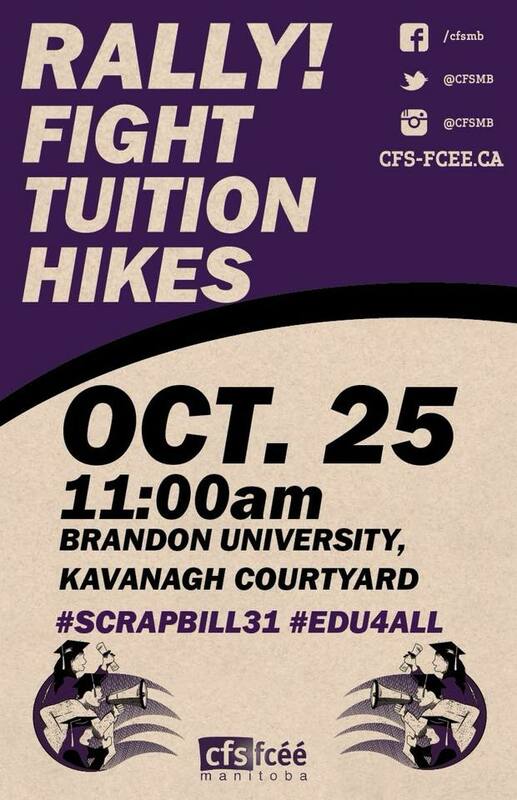 Come on out, make some signs, and join BUSU in protest of crippling debt to the next generation of Manitobans. If you need further information, contact BUSU in their office!